By Gloria Duchin, Inc. It is dated either 1989 or 1999, the date is engraved on the back, but is so small that I can't say for sure. 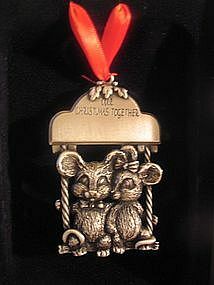 The front of the ornament says "Our Christmas Together." It is still attached to the display box. I need your zip code to calculate the postage.